All the universes that have ever existed have collided and mushed together to form a single entity called Battleworld. After Battleworld is created there is no 2099 universe, no 616 universe, no Age of Apocalypse universe, no Marvel Zombies Universe and no Ultimates Universe. Instead they are all merged into one single entity and that is Battleworld. A single Universe will emerge out of Battleworld and it will be a hodge podge of all the prior universes. Battleworld is kind of like a big quilt of universes and stories. In one universe Ultron may have taken over now that world is now a region smushed into Battleworld. Keep in mind some of these are still educated guesses. This is Planet Hulk. Greenland references the Hulk get it "Green" land. This is an Island so I presume this represents the Spider-Island or some other Spider-Man based world. It could house the surviving versions of Spider-Man seen in the Spider-Verse storyline. 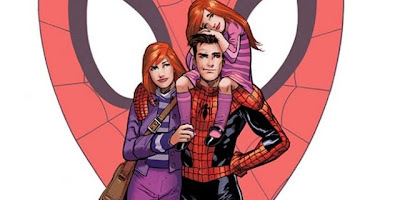 World where Spider-Man and Mary Jane are still together and had children. Could be the MC2 universe where this happened. If it is the MC2 universe though it could be weird because that Peter Parker and MJ were just killed in the Spider-Verse event. The daughter he has here also does not look like Mayday. My guess is that this is a separate universe where Peter selected to let Aunt May die instead of trading his marriage for her life like he did in Brand New Day. The world where Iron Fist gets his powers. This makes me think of Magneto's Avalon space station. This could potentially be a world ruled by Magneto. This is fairly similar to House of M. My other thought is a place where all the Marvel gods like Thor and Hercules end up. Could either be Avengers vs X-Men or maybe a world of Babies? World of Magic? reference to Doctor Strange's item the eye of Agamotto. This is the center of the map and likely where a lot of the events in Secret Wars will take place. If you look on the map you will actually see a submap. The Submap breaks Manhattan into subsections. Manhattan will be the NYC of Ultimates World and 616 Universe smushed together. Also within Manhattan is New Attilan the home of the main Marvel universe's Inhumans. Then underneath the city is Monsteropolis. My guess is this where all the monsters of the Marvel Universe will turn up. I am thinking maybe a world where the Hand rules the world. Perhaps a place to house all of the Asian based characters. There are many from the Marvel Mangaverse. I was thinking this world could be world of the hell demons and gods like Hella and Mephisto? Maybe Dormmamu? Maybe this is where all the universes great evils will battle it out to see who comes on top. I presume a world where Hydra took over. World of Kree heroes or where Kree took over Earth? World of House of M where Mutants rule the world. Mutant alternate reality I'm not sure which one. I don't know exactly what this is but I presume it will deal with a world where Mister Sinister takes over the world. Perfection will be the world from Age of Ultrons and the Deadlands will be the world from Marvel Zombies. Nova and the Guardians of the Galaxy will likely end up here along with Thanos. This looks like a wall that separates the realms on the bottom of the world from the rest. I am not sure what it is yet. It looks like it would block off realms 38, 39, 40. Basically the Zombies, Ultrons and Infinity Gauntlet worlds.